Our banner display at World Youth Day Panama on the Four Steps to Vocation Discernment was a big hit. An article (in English and Spanish) and pdf of "Four steps to vocation discernment" now available. Click here for more. The VISION crew met thousands of World Youth Day pilgrims at the Vocation Fair in Panama City's Omar Park. We passed out prayer cards and VISION bookmarks and signed up pilgrims to receive daily "Take Five" meditations and stay connected with VISION. One lucky pilgrim won our Fit Bit door prize. We look forward to the 2022 World Youth Day in Lisbon, Portugal. Hope to see you there! Parque Omar, Section A, booths 23, 24, 25. Walk through our "Steps to Discernment" display and enter to win a fitbit! Fiat International Festival for Youth and Young Adults, hosted by the U.S.A. Featuring music, witness talks, prayer, dialogue. Learn more here. The Sisters of Charity of Nazareth featured Sr. Pat Haley, S.C.N. in a recent newsletter. This line caught our attention: "I will not work in a segregated dining room, obedience or no obedience . . ."
Learn more about the Sisters of Charity of Nazareth here. 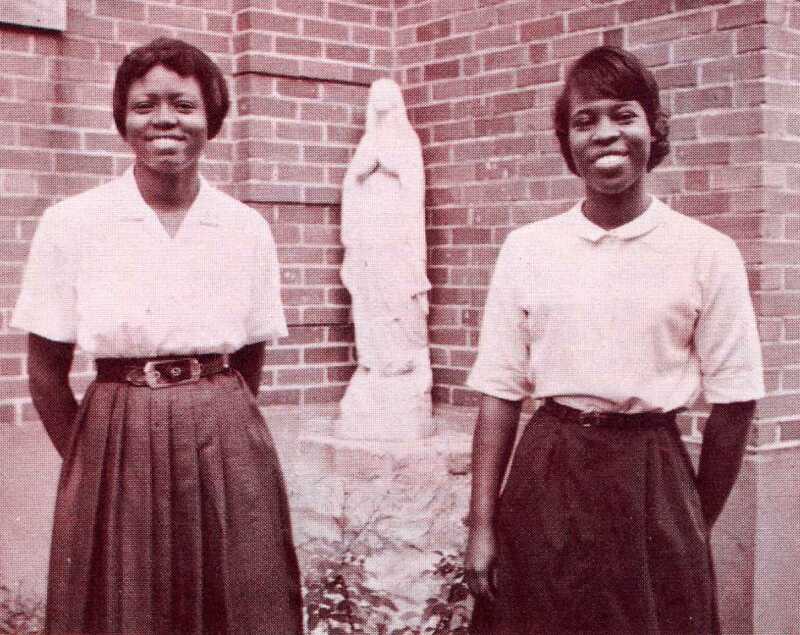 Sister Pat Haley (left) and Betty Collier, newly graduated from Holy Family Mission School, were featured in a local paper for their plans to enter religious communities. VISION has a gift for your in honor of Giving Tuesday: Our VISION Giving Calendar! Find great ideas on the VISION Giving Calendar. Make every day of December a day of giving. Enjoy and thank you for giving! Feel free to share with others! Donate to support VISION Vocation Network. The National Religious Vocation Conference, VISION's parent organization, hosted a conversation with young Catholics recently about their faith, their challenges, and how older Catholics can be of service to them. One youung person's advice to all Catholics: "Speak less. Pray more. Be faithful." According to the Times report, "As most sightseers to the real Sistine Chapel know, the visit isn’t always edifying. The hall, though large, is almost always packed, and even though silence is mandatory it can be noisy experience. Ensuring that visitors have a positive experience there 'is constantly on my mind,' said Barbara Jatta, director of the Vatican Museums, and a problem that still has to be resolved. Ms. Jatta saw a rehearsal of the 'Universal Judgment' by artistic director Marco Balich and gave it a thumbs up. "It’s a delicate way to tell a beautiful story of faith, art and history," she says. And it communicates the Sistine Chapel "in a way that many generations can understand." Asked whether she thought it could replace going to see the real thing, "No, sorry," she said. Pope Francis said that a life which isn't shared with others "belongs in the museum," according to Inés San Martín reporting for Crux. In a Google hangout with youth from around the world, the Pope urged young people not to succumb to an "elitist education" but to be agents of a "human globalization." The 1969 Mary Tyler Moore-starrer "Change of Habit" is one of many Hollywood films about Catholic sisters. The late actress Mary Tyler Moore (1937-2017), who died this month, once played a nun on screen. Among Moore's long list of film and TV credits, she starred in "Change of Habit," a 1969 film in which she depicted a Catholic sister who was, as the movie's trailer pronounces, "dedicated to her calling but at heart a woman." That is, she was yet another woman of her era who had a crush on Elvis. The movie is one of many Hollywood films about Catholic sisters. From Julie Andrews as a rambunctious novice in "The Sound of Music" to Susan Sarandon as Sister Helen Prejean in "Dead Man Walking," films have frequently turned a lens on life as a sister. Catholic sisters themselves take issue with inaccuracies, but pop culture curiosity about religious life seems to live on. Father George "Jerry" Hogan speaks with Ariyana Rivera, who was confirmed at a Catholic Mass at Circus Vargas in Burbank, California. The Los Angeles Times reports that Father George "Jerry" Hogan is celebrating the sacraments with circus performers, allowing them to work around busy performance schedules and make time for their faith. Recently, 11 members from the Circus Vargas troupe—mainly the children of performers—took their next steps into the Catholic faith with Confirmation. Father Hogan understands that for many of the performers there is not much free time outside of practice and performing. He said, "They do three shows on Saturday and three shows on Sunday, so it's impossible for them to go to church." He has been ministering to circus performers for more than 22 years, and he even has circus vestments. He is not alone in his suprising ministry. Sisters Dorothy Frabritze and Mary Seibert help to prepare performers and their children for the sacraments while on the road, and transform the center ring into a space suitable for Mass by adding an area for Baptism and an altar. The performers are grateful to have Father Hogan to minister to them. Josue Marinelli, who received his First Communion and was confirmed by Hogan a few years ago, said, "My older daughter was also baptized by Father Jerry. It's kind of like a family tradition, which is hard, working in the circus because we're always traveling around. Luckily, we have Father Jerry to help us out." This week on ABC's "The View," actress Whoopi Goldberg surprised the Franciscan Handmaids of the Most Pure Heart of Mary in Harlem, New York, by showing up on air dressed in a habit like her character from her 1992 film Sister Act. She gave the order a $10,000 donation to stock their food pantry as well as a new car to help with transportation of food. The sisters are one of only three orders of black nuns in the United States and recently celebrated their 100th anniversary. Sister Gertrude Ihenacho is often told she resembles Whoopi Goldberg in Sister Act and often gets asked for her autograph. She cried tears of joy when the Hollywood star came out on stage in a habit. In the above video, CBS Evening News profiled Sister Martha Mary Carpenter, O.S.F., the principal of Saint Peter Mission School in the Gila River Indian Community, home to the Pima tribe, in Arizona. Many there suffer from adult-onset diabetes, even children, so Sister Carpenter began to make lifestyle changes a part of the students' school day. Now, they run before classes each morning to stay healthy and keep energy levels high. She has even challenged the Federal government and modified the school lunch guidelines for her students. "We don't teach subjects, we teach children," she said. "And we're giving them the skills, lifelong healthy habits. How to eat and how to inexpensively take care of yourself, good running shoes and take-off." On April 29 the Trevi Fountain in Rome was part of a graphic display commemorating the persecution many Christians face in the world today. This week, the Trevi Fountain in Rome was lit up in red in memory of the blood shed by Christian martyrs throughout the world. The Catholic News Service reports that the event was sponsored by Aid to the Church in Need, a Catholic charity that seeks to "draw attention to the dramatic issue of anti-Christian persecution" around the globe. The event included guest speakers, who shared stories of men and women who have died for their faith. Images of these martyrs were projected onto the fountain, including those of four Missionaries of Charity who were murdered in Yemen in March. Through this visual representation of the plight of modern Christian martyrs, the church hopes to increase awareness of a growing worldwide problem. New discernment app from the Sisters of Bon Secours sets the bar high for vocation resources. The Sisters of Bon Secours have launched an amazing, eye-catching, heartstring-pulling app, Imagine a Sister's Life, to explore what religious life is all about and what it would be like to be a sister. The free app includes daily reflections, blogs, news and views, faith sharing, virtual retreats, upcoming events, and stories about how sisters were called and their passion for their vocation. The sisters developed the app to create a place "where a busy young seeker of truth can pause to reflect on the meaning of life, pray in silence, and read articles and thought-provoking commentary on world conditions and social justice efforts." What's more, "Young adults can share their thoughts online and share opportunities to get involved in helping those unable to help themselves. The application gives them a gentle reminder of the presence of God in their life and provides many areas of support and knowledge as they continue to grow through their life experiences. For those interested in learning more about religious life there are a variety of professional videos that give them a sense of what an active life in community and ministry looks like as a sister." The sisters said, "Based on current world conditions, the millennials will be called upon over the course of their lifetime to make many serious moral and ethical decisions both in their own lives and in protecting the health and well-being of others globally. It is hoped that this application proves to be a strong support for young adults, creating an online community that enriches their journey of faith." "James A. Flavin wore old clothes, drove a beat-up old car, and lived alone in a small home he had inherited from his parents in a poor inner-city neighborhood," writes Chicago Sun-Times columnist Mark Brown. "When he died a year ago at age 71 with no obvious family in the picture, his fellow parishioners at St. Adrian’s Catholic Church in Marquette Park came together to give him a proper funeral and burial." What nobody knew was that Flavin, an alumnus of St. Ignatius, a Jesuit high school in Chicago, was a wealthy man. A safe deposit box discovered after his death revealed stocks and investments valued above $3.4 million. And more surprising, a will prepared in 2008 indicated that Flavin wanted the bulk of his estate to go to the Sisters of Mercy, who had educated his mother. The authenticity of the will needs to be verified, but as his only living relatives aren't disputing the terms set in the 2008 document, it looks as though the Sisters of Mercy are in for some money. How nice! Founded by Saint Francis of Assisi more than 800 years ago, the Franciscan order continues to find new ways to pray and preach the Good News of Jesus worldwide. As part of their 800-year tradition, Franciscan friars pray for the intentions of those who ask and now continue to with the help of technology. The U.S. Franciscans have developed "The Friar App", available in both the Apple App and Google Play stores, for the faithful to send prayer intentions to Franciscan friars across the United States and for followers of the app to lift up those prayers as one community of faith. Followers of the app can join in the prayers of others in addition to posting their own prayer requests. It's free to download and post and follow prayers, but for a small fee, you may have a real candle lit in a Franciscan church for a particular intention. Discover more about the many provinces of Franciscan Friars serving both domestic and foreign missions in a variety of ministries. Father Bernard Kinvi assists refugees in the Central African Republic. He was nominated for the Aurora Prize for Awakening Humanity for his work in the region. FoxNews reports that Father Bernard Kinvi, of the Order of St. Camillus, has been nominated for the Aurora Prize for Awakening Humanity, an annual international peace prize that honors those who put their lives at risk to serve others. Father Kinvi was nominated because of his heroic rescue of more than 1,500 Muslims in the Central African Republic. He started a church and mission hospital three years ago in the northwestern town of Bossemptee, where fighting between Muslim and Christian extremists escalated in 2013. Despite being threatened for his actions, he has helped Muslims who were targeted find refuge in neighboring Cameroon. If he wins the prize, Father Kinvi plans to use the money to continue his work is Bossemptee. He was honored to be recognized, saying, “There are many priests and nuns who carry out the same type of work as I do. Just like me, they work quietly and do not seek recognition." The winner of the Aurora Prize receives $100,000, and $1 million goes to the charity of their choice. Filipino nun asks: "What would Leo do?" Leonardo DiCaprio advocated for environmental protection during his Oscar speech, an issue important to the church. The Catholic Herald reports that Sister Aloha Vergara of the Handmaids of the House of God in the Philippines is behind movie actor Leonardo DiCaprio all the way. Upon winning his first Academy Award in February, he made a plea on behalf of the environment and condemned the “politics of greed.” Sister Vergara recently attended a conference at which Catholic and Protestant religious and environmental activists denounced alleged human rights violations in a mining town in the northern Philippines. She said we need to “support those who speak for all those who are affected of corporate greed and the destruction of the environment,” including high-profile advocates such as DiCaprio. Redemptorist Brother Ciriaco Santiago, convener of an anti-mining group in Manila, hopes that environmental issues will be important to citizens in upcoming national elections. He believes DiCaprio's message about the environment came at a perfect time, especially because the country's resources have been abused and health conditions have worsened. “Actions and programs that destroy creation [are] an attack on the Church’s mission; therefore, the Church should be in the front line to protect people who go against these plunderers of the environment,” said Lito Latorre, coordinator of the Philippine Redemptorists’ Justice, Peace and Integrity of Creation program. In the Oscar-nominated short film "Ave Maria," Carmelites help a Jewish family whose car breaks down outside their convent in the West Bank. "Ave Maria" is one of five live-action short films nominated for the Academy Award this year and is getting great reviews from religious sisters, as well as from Jewish and Palestinian Arab and Christian audiences, according to The Global Sisters Report. This 14-minute comedy of errors combines the unlikely encounter between contemplative Carmelite nuns who live a vow of silence and a family of Jewish settlers whose car breaks down in front of the convent in the Palestinian West Bank. The Jewish settlers are struggling to adhere to the Sabbath laws while the sisters are attempting to help repair the car with no verbal communication. Palestinian-British director Basil Khalil wanted to highlight in the film that sometimes "strict rules can be broken for the common good. ... It won't be the end of the world when you reach out to help someone in need, even though you might have to break a rule or two." Learn more about the Carmelite order here. In March, the pope will release a new children's book published by Chicago's Loyola Press. According to The Huffington Post, Pope Francis is publishing a book of his responses to letters from children. The book, Dear Pope Francis, will be out March 1 from Loyola Press in Chicago. The pope selected 30 letters and responded to each, often complimenting the artwork of the children. Father Antonio Spadaro, who, like Pope Francis, is a Jesuit and is also the director of the Rome-based journal La Civilta Cattolica, was instrumental in the project, working with Tom McGrath, a vice president at the Jesuit-founded Loyola Press, to co-edit the book. About 250 letters to the pope from kids aged 6 to 13 were received in 14 languages and from 26 countries around the world. The book will be released in the United States in English and Spanish, and as part of an international Jesuit project, it will also be published in Brazil, Indonesia, Slovenia, Mexico, and India. Accomplished skater Sister Maria Pavla Hudacekova took to the ice at a rink in Bratislava, Slovakia. The Catholic News Agency reports that Ursuline Sister Maria Pavla Hudacekova figure skated in full habit, even completing a 12-spin pirouette, at a rink in Slovakia, and a teen captured the moment with a cell phone, producing a video that has gone viral. During her 10 years in religious life, Sister Maria has used skating to evangelize. “I used to hold religious meetings with ice hockey players. I spoke to them about Jesus and supported them,” she said. When she is not skating, Sister Maria coaches young figure skaters and teaches math and IT at a primary school in Bratislava. Trappist Cistercian monk Thomas Merton is the subject of a new play commemorating his 100th birthday. A new play, "The Glory of the World," by Charles Mee, being staged at New York's Brooklyn Academy of Music, explores the life of Trappist monk, mystic, and philosopher Thomas Merton. The New York Times reports that the play is set at a 100th birthday party for Merton, where the guests take turns arguing about how to describe the life and works of "a prolific writer, a champion of nonviolence, and a friend to Eastern religions before dying at 53 of an accidental electrocution in Thailand." A former Episcopal monk and lottery winner, Roy Cockrum, of Knoxville, Tennessee, is financing the production. During his time as a monk, Cockrum lived a vow of poverty and always said if he were to come into money, he would donate to theater. Read more here about this production celebrating Thomas Merton, who, along with Abraham Lincoln, Martin Luther King Jr., and Dorothy Day, was the subject of Pope Francis' recent address to Congress. Discover more about Trappists monks and nuns here. Sister Elisabeth Anne asks for donations of food at the Hunts Point Produce Market in the Bronx. According to the New York Times, Sister Elisabeth Anne has visited the Hunts Point Produce Market in the Bronx every Wednesday for the past 35 years. The 76-year-old squeezes fruit and greets the workers as she shops for food to prepare at the Queen of Peace Residence in Queens Village, where she lives and works. There is one difference to this shopping though: Sister Elisabeth Anne does not pay for the food. Instead, she solicits donations from the businesses that sell their goods at the market. Donations from businesses, parishes, and foundations help to keep the Queen of Peace Residence going. The home shelters and feeds 85 low-income older adults and 19 nuns, who also live in the building serving the residents. It is one of 197 homes around the world run by the Little Sisters of the Poor, an order whose mission is to support the elderly poor. Resident Winnie Valcancick, 78, moved in recently and is very grateful to have a safe and friendly environment to live in. “It’s very scary as you get older and you’re not financially equipped to pay the rents that New Yorkers have to pay,” she said. Pope Francis visits a home for the elderly in Rome. The Catholic Herald reports that Pope Francis made an unannounced visit to care centers for the elderly in Rome as part of his personal observation of the Holy Year of Mercy. The Vatican used #MercyFriday to announce the pope’s visit. The pope plans to perform a work of mercy, personally and privately, on one Friday each month, although this began quite publically in December when he visited and celebrated Mass at a shelter. This time around, the Vatican chose to keep it a surprise and did not inform journalists nor the residents of the care centers ahead of time. The Institute for the Psychological Sciences in Virginia will become Divine Mercy University. The Institute of Psychological Sciences (IPS) in Arlington, Virginia, announced that it is expanding its offerings this year with a new School of Counseling, which will offer doctorate and master’s degrees, and that the broader organization will be called Divine Mercy University. According to Catholic News Agency, the new school name is a celebration of the Holy Year of Mercy. Jessie Tappel, director of communications for IPS, explained that Divine Mercy University is a “mission-centric name” because the school will have an outward focus on mercy. The university is unique in that it grounds its psychological and mental health training in Catholic-Christian values and emphasizes the importance of coming up with holistic solutions for clients. Students spend their time learning psychology through the lenses of philosophy and theology, in addition to their rigorous academic and clinical work in order to become mental health professionals who can bring a strong sense of faith to those they serve. Sister Ann Geever (left), a veteran Catholic school teacher, serves as a tutor at San Antonio's Visitation House. Sister Ann Geever was profiled in the San Antonio Express-News for her work at San Antonio's Visitation House, a transitional home for kids that is run by the Sisters of Charity of the Incarnate Word. Sister Geever is a tutor, along with nine others including two other sisters, who work with the children almost every day to support their studies in school. Sister Geever taught in Catholic schools around the country for more than 40 years and uses that experience while helping kids such as 10-year-old Andres Garcia, whom she calls “my darling.” Garcia is in fourth grade and has some difficulty reading. Sister Geever helps to improve his confidence as well as advocate for him to his teachers. Sister Yolanda Tarango of the Sisters of Charity said that the “give-and-take” between tutors and students is so important to the improved academic performance of the Visitation House’s young residents. In its 30 years, the nonprofit has seen students such as Garcia become first-generation college students, thanks to tutors such as Sister Geever and many other volunteers. The Jubilee Year of Mercy began Dec. 8 and will continue through Nov. 20, 2016. Being merciful can sometimes take practice. That's why Aleteia has compiled a list of 56 ways that one can be merciful during this Year of Mercy. The list has suggestions for both parents and young people, and even some ways families can act mercifully together. From “Offering to drive an elderly person to mass” to “Offering hospitality in your home to someone or a group of people you would normally never invite over,” this list of suggestions provides helpful ways to begin and continue your journey toward mercy. You can find the full list of suggestions here. Sister Rita Lee will star in a new BBC One series, "Sister Rita to the Rescue." A sister for more than 50 years, she fights poverty in her economically depressed British community. The Telegraph reports that Sister Rita Lee is set to star in her own five-part BBC One series, "Sister Rita to the Rescue." To locals in Manchester, England, Sister Rita is known as “Attila the Nun” because of her strength in advocating for those often forgotten in society, especially in her inner-city neighborhood, Collyhurst. At the age of 13, she began to hear her call when two nuns from Manchester came to her school in Cork to discuss vocation. They talked about Manchester, the poverty there, and a nursery in which they cared for children. At the age of 18, Rita joined a convent in Manchester and went on to work in the convent school. When the school closed, she worked in various other charitable organizations and eventually ended up in her current home of Collyhurst. She is excited about the show airing but hopes viewers understand the message. "There’s a bit of a hype about all this, and there’s nothing hype about here," she said. "There’s nobody here above anyone else. We are all on the same level. And that’s it." Pope Francis spoke to the Association of Catholic School Parents about promoting support, acceptance, and harmony. In a meeting with the Association of Catholic School Parents, Pope Francis encouraged strong ties between families and schools, according to Vatican Radio. The pope spoke directly to parents in his address, emphasizing the importance of “building bridges” between schools, families, country, and other organizations in order to promote harmony. He said parents have a responsibility to advocate for their children’s education and make sure Catholic schools live up to their values. He added that Catholics must be accepting of everyone and not elitist in selecting education recipients. Pope Francis reminded priests to acknowledge the families that support them. The Catholic News Service reports that Pope Francis urged priests and their superiors to remember their roots and acknowledge the families and communities that support them throughout their spiritual journeys. Addressing a group of priests and bishops, he said, “You cannot be a priest believing that you were created in a laboratory. No, it begins in the family with the tradition of the faith and all the experiences of the family." The priests and bishops were gathered for a conference sponsored by the Congregation for Clergy to celebrate the 50th anniversary of the Vatican II decrees on priestly formation and on priestly ministry and life. Students from high schools and universities around the country spoke with lawmakers about climate change, immigration, and human rights. The Christian Post reports that hundreds of Catholic high school and college students met in Washington, D.C., last week and urged Congress to stand with Pope Francis and his message on climate change, immigration, and human rights in Central America. Over the weekend, the students met with members of Congress and discussed policy. At the end of the conference, the Ignatian Solidarity Network hosted a day of advocacy on Capitol Hill, the largest Catholic advocacy day of the year. Sister to compete for charity on Food Network’s "Chopped"
Sister Alicia Torres prepares for a Thanksgiving-themed charity competition on the Food Network's "Chopped." According to Crux, Sister Alicia Torres, a member of the Franciscans of the Eucharist in Chicago, is set to compete against three other cooks in a Thanksgiving episode of the Food Network’s Chopped, set to air Monday, Nov. 9. The four contestants are part of the “Thanksgiving Soup-er Stars” episode and were chosen because of their work in soup kitchens. On the show, they are given a basket of mystery ingredients from which they must create a unique and stylish dish. There are three rounds: appetizer, entrée, and dessert. A chef is eliminated after each round and the winner will receive $10,000 to donate to charity. Be sure to tune in and cheer on Sister Alicia this Monday! Andrea Pearson Tande, left, and Sister Suzanne Herder sort baskets for a silent auction in St. Paul, Minnesota. Tande is nearing the completion of a two-year process to become a lay consociate of the Sisters of St. Joseph of Carondelet. There are many Catholics who have not been called to vowed consecrated life but rather as formal associates of religious communities. These lay men and women, often called associates, consociates, oblates, or companions, share a commitment to living a particular religious order’s charism, or spirit. These communities invite associates into their ministry and way of thinking. Most associates choose religious communities because they have been exposed to the community before, such as in school, or they have a strong will to share in the ministry of a particular community. Many orders invite associates from all walks of life to join them in ministry and prayer. Men, women, singles, couples, Catholic and non-Catholic, working and retired, may share in the religious community. Pope Francis addresses the crowd in St. Peter's Square on All Saints' Day. In his message on All Saints' Day, Pope Francis emphasized the importance of "next-door saints" who are not officially canonized by the church but are an example to all. Speaking to a crowd in St. Peter’s Square in Rome, he said, “We experience in a particularly vivid way the reality of the communion of saints, our extended family, made up of all members of the Church, both those who are still pilgrims on earth, and those—immensely more—who have already departed for heaven.” He said canonized saints as well as "next-door saints" who live ordinary lives are models for the faithful. He said that the latter are saints nonetheless and that they encourage all to find God in all aspects of life. A group of young people take a selfie with Pope Francis. The National Catholic Register recently reported that Catholic bishops are focusing on youth ministry as an important factor in renewing the life of local churches. St. John Vianney Parish in Goodyear, Arizona, offers a great example of how to minister to youth in a meaningful way. Located in a suburb of Phoenix, the parish has nearly doubled the size of its youth program, transforming it from traditional sacramental preparation to a more holistic approach of teaching youth from primary school through high school to be disciples in the world outside the church. David Portugal, director of parish catechesis, works with youth and their families for sacramental preparation and in an “after sacrament program” in primary school and then taps high school and college participants to educate others. “We want to put to work all these [young people] we’ve formed,” he said. A number of dioceses are engaging in similar practices, working to keep young people involved in the church. In the Diocese of Rochester, New York, Noelle Hiester, director of the office of evangelization and catechesis, said the diocese is providing opportunities for spiritual growth in which youth can respond to the “lived experience of the faith through events such as the National Catholic Youth Conference," which help young Catholics connect with others like them. Developing youth ministry has great benefits for parishes and the faith as a whole. At St. John Vianney, the program has resulted in three going to seminary and nine to work in the diocese, as well as contributed to healthy marriages and new families forming. San Anton Catholic Church in Madrid, Spain, is open 24 hours a day and boasts amenities such as free wifi and pet-friendly spaces within the church. The BBC recently featured San Anton Catholic Church in Madrid, Spain, that has made some significant changes including staying open 24 hours a day to both people and pets in order to help more encounter God. The church even has its own confession mobile app and free wifi. While these changes are not without criticism, one member defends this new church atmosphere. He explains, "We wanted to follow Pope Franicis' words. He advocates an open church where people can come day and night. So people who are away from the church can come back without any conditions." You can watch and learn more about what San Anton has to offer here. Sister Colleen Gibson, S.S.J. (right) and other young sisters shared their discernment journeys in a recent New York Times article. The increasing interest in religious life among millennial women in America may be surprising to the New York Times, and due in part to social media and reality television shows, but in the article, Sister Colleen Gibson, S.S.J., VISION Vocation Guide and Take Five for Faith author, corrects those notions. “I’ve never met anybody, who was like, ‘Oh yeah, I saw Christina on the Italian Voice and that really made me want to be a sister!’” Gibson said. Instead, she says, it is usually face-to-face interaction that helps young women realize their vocations. However, this does come from someone who found her congregation on VISION Vocation Match, an online tool to help people in discernment find a religious community that fits with them. “It’s basically Match.com for nuns,” Gibson said. There are many steps to becoming a Catholic sister and VISION Vocation Match and other online outlets are a great place to start the learning process and begin to connect with other discerners and sisters—a virtual introduction to religious life that jibes with the young. According to the article, the National Religious Vocation Conference reported that of the more than 2,500 women who completed online VISION Vocation Match profiles in 2013, the majority were under 30. Read Sister Colleen Gibson's 2016 VISION article, "Why being single and living as a sister aren't the same," and check out Take Five for Faith, daily renewal for busy Catholics. The Francis Fund, one of three key initiatives to combat poverty, as part of the World Gathering of Families programs. Update: Pope stopped on his way to celebrate his final Mass in Philadelphia to view the "Knotted Grotto" art installation, sponsored by MercyandJustice.org. Knotted Grotto, desiged in honor of Mary, Undoer of Knots, Pope Francis' favorite artwork. Visitors of the grotto add or remove knots that symbolize their personal struggles and their desire to help others. "Since launching the World Meeting of Families Committee on Hunger and Homelessness, reports Jaleem Kaleem, "Scullion has used the pope’s high-profile visit and the convergence this week of the nation’s leading Catholic figures to raise $1.3 million to aid 52 projects and organizations centered on helping people struggling with poverty, mental illness or both." “Pope Francis says the greatest virtue is mercy,” says Scullion. “But he also said that concrete works of mercy and spiritual development are not enough. We also need systemic change.” Learn more about the works Scullion helped spearhead at MercyAndJustice.org. Click her for more informations on the Sisters of Mercy of the Americas. Father Bob Simon with his Lego replica of the Vatican and St. Peter's Square. USA Today recently profiled Father Bob Simon, who built a replica of the Vatican out of Legos. Father Simon, pastor of St. Catherine of Siena Church in Moscow, Pennsylvania, first attempted the project in grade school, but it “didn’t look anything like the real thing,” he said. Ever since, he had wanted to build a more realistic model of the Vatican and St. Peter’s Square, and when Pope Francis’ visit to the United States was announced, it seemed like the right time to try again. In September 2014, he began the building process. It took about 10 months and nearly half a million Legos, but the end result was good enough to be featured in a display at the Franklin Institute in Philadelphia. According to Larry Dubinski, president and CEO of the Franklin Institute, the replica and other Lego creations have brought “record crowds” in this summer. The replica features a figure of the pope waving to a crowd along with figures of nuns with iPhones. Even a figure of Elvis is included. Father Simon said, "St. Peter's Square is one of those places where people from all over the world come together." He compared the repetitive process of building the replica to praying the rosary. "While your hands are busy, your mind and heart are elsewhere," he said. "It frees up the mind." Pope Francis gives a homily during Mass in Havana, Cuba, on Sept. 20, 2015. Pope Francis focused on the Christian call to service during his first Mass in Cuba this week, according to The Catholic News Agency. “Being a Christian entails promoting the dignity of our brothers and sisters, fighting for it, living for it,” he said. Francis addressed thousands of people gathered for Mass in Havana’s Plaza de la Revolución, or Revolution Square. He is the third pope to visit Cuba, preceded by Saint Pope John Paul II and Pope Emeritus Benedict XVI. During his homily, Francis said, “Service is never ideological, for we do not serve ideas, we serve people." The healing of a Brazilian man could be the miracle that leads to the canonization of Blessed Mother Teresa. The Vatican is investigating a possible miracle that could lead to the canonization of Blessed Mother Teresa of Calcutta, according to the Catholic News Agency. It is a case of a Brazilian man who was cured of brain abscesses after his family prayed for the intercession of Mother Teresa. Pope Francis has expressed a desire to canonize Mother Teresa during the Jubilee Year of Mercy, which will begin on Dec. 8. The pope “wants to beatify and canonize men and women that were a sign of mercy for the world in this Jubilee [Year], and Mother Teresa is a model,” said Father Caetano Rizzi, who works for the Vatican’s Congregation for the Causes of Saints. Mother Teresa founded the Missionaries of Charity and ministered to the poor in India for most of her life. She won the Nobel Peace Prize for her work in 1979. She died in 1997 and was beatified in 2003. A second miracle credited to her intercession is required before she can be recognised as a saint. A monk walks around the grounds of Holy Cross Abbey, which began implementing more environmentally sustainable measures at the monastery eight years ago. The monks at Holy Cross Abbey, a Trappist monastery in Berryville, Virginia, decided in 2007 to work harder at being better stewards of the earth, which is part of their Cistercian tradition. Pope Francis’ recent encyclical on protecting the environment has bolstered their resolve. According to Catholic News Agency, the monks turned to the University of Michigan’s School of Natural Resources and Environment to author a study on how the abbey could become more sustainable. The resulting 400-page study, “Reinhabitating Place,” provided many suggestions, and since, the Trappists have taken steps to prevent cattle from polluting the river that runs through their property and planted native hardwoods and bushes in order to attract migrant animals, insects, and pollinators to restore proper biodiversity to the area. They also switched their heating and fueling sources to propane gas, and even started offering “green” burials, which eliminate the embalming fluids and lead in coffins that can be detrimental to soil. The monks hope that their initiative may serve as a model for low-tech, low-cost solutions to environmental problems, especially in developing countries. How well do you know Pope Francis? Test your knowledge of Pope Francis! In anticipation of Pope Francis’ upcoming visit to the United States, The Huffington Post has released a quiz called “How Well Do You Know Pope Francis?” The quiz asks questions about his early life, papal activities, and even his favorite sport! See how well you know Pope Francis and take the quiz here. Sister Stella Matutina, O.S.B. speaks out against the environmental damage and human rights violations caused by mining in the Philippines. For her work defending human rights and the environment, Philippines-based Sister Stella Matutina, O.S.B. was named the winner of the 2015 Weimar Award for Human Rights, according to Minda News and the Sisters' Association in Mindanao. The award is bestowed by the city council of Weimar, Germany, which decided the 47-year-old Benedictine nun deserved to be honored after learning about her fight against international gold mining companies for polluting and abusing workers in her homeland. “This highlights the situation of Mindanao and the Philippines in general where the poor, the farmers, the indigenous peoples, the human rights activists and defenders of the environment endure harassment and face risks and death,” Sister Matutina said. Sister Matutina heads the Sisters’ Association in Mindanao (SAMIN) and has herself faced threats and false accusations that she's a communist rebel. Sister Matutina will receive the award on Dec. 10, which is International Human Rights Day. Sister Patricia McCarron has served as Notre Dame Preparatory School's headmistress for 10 years, as a School Sister of Notre Dame for 25, and as a teacher for 30. Women tend to be underrepresented in the sciences, because they often aren't encouraged to explore those fields, but Sister Patricia McCarron, headmistress at Notre Dame Preparatory School for girls in Towson, Maryland, is working to change that. A work of art dedicated to Pope Francis and the family of the 21st century. According to the Catholic News Service, the World Meeting of Families (organized by the Pontifical Council for the Family) and the City of Philadelphia Mural Arts Program have created a new mural for Pope Francis' visit to the city in September. Watch the video here. in their garden, which is part of the order's sustainability plan. Pope Francis may be making headlines for his recent challenge on climate change, but environmental action in the church is nothing new. Caring for the earth has always been part of the Franciscan spirit, and one Franciscan order, the Sisters of St. Francis of Assisi near Milwaukee, Wisconsin, has been practicing sustainability on its campus near Lake Michigan for years. According to Milwaukee Public Radio, the order created a land-use committee in 2009, received a grant to help remove invasive plants, and are transforming an old athletic field into an urban forest. They also maintain bee boxes and vegetable gardens on their property. The sisters rely on volunteers, the local Boy Scouts in particular, for help. They also have a group called “Habitat Healers,” which meets every Thursday morning to work where needed. The sisters plan to eventually turn their headquarters into a meeting place for environmental groups. They hope that combining environmental stewardship with spirituality will be part of the order’s legacy. At the age of 81, Sister Maria Concetta Esu continues her lifelong work as a midwife in the Congo. Pope Francis recently blessed the hands of Sister Maria Concetta Esu, 81, who has delivered more than 34,000 babies while working as a midwife in the Democratic Republic of the Congo. "The task of a midwife brings me great joy because God gives life but he doesn't give birth," says Sister Esu in an article by Agence France Presse. Sister Esu works in the clinic run by her order, the Daughters of Saint Joseph of Genoni. About 40 babies are born in the clinic each month, and several parents have named their newborns Maria, after Sister Esu. She was originally trained as a nurse in Italy and then studied tropical medicine in Belgium. She moved to the Congo in 1959, a year before the country’s independence. Throughout the violence of wars and the rule of a dictator hostile to the Catholic Church, her mission became a haven of peace and assistance for many. Currently, tension remains high in the country amid suspicions of political corruption, but Sister Esu says she has no plans to flee, explaining, "I want to stay here. I don't want to be a deserter. I've given my whole life here and I shall also give my bones." Italy, debuted at No. 1 on Billboard’s classical music chart. Benedictine monks in Norcia, Italy—birthplace of Saint Benedict and his twin sister Saint Scholastica—have recently debuted at No. 1 on Billboard's classical music chart for their album of Gregorian chant, "Benedicta." Prior Cassian Folsom, the monastery's leader, founded the community of 18 men, half of them Americans, in Rome, but the people of Norcia recruited the monks to move into the town's ancient monastery. Read the full story of the Benedictine community here. Philippines to raise funds for their congregation's hospital. Four Sisters of St. Paul of Chartres recently climbed Mount Talamitam in the Philippines to raise awareness and funds for the sick and poor. Sister Arcelita Sarnillo, 61; Sister Rachelle Rapio, 34; Sister Anna Maria Reyes, 49; and Sister Aurelie Cortez, 77, scaled the 630-meter mountain wearing gym shoes and hiking pants under their habits. Along the way, fellow hikers asked to take “selfies” with the nuns, amazed by how the four women were putting their faith in action. This was the nuns' first charity hike to help benefit St. Paul Hospital, which is run by the congregation, in Dasmariñas City. The hospital offers free medical consultations and operations for the poor. The funds raised by the hike will help patients with cleft palates and cleft lips that cannot afford surgery. Sister Sarnillo found the experience challenging, but kept her eye on the finish line. “I just kept on meditating and looking up,” she said. Once on the summit, the nuns led a short prayer at the Marian grotto. They sang “Hail Mary” before starting their two-hour descent. For their next climb, they plan to invite a priest to celebrate Mass at the summit to make the experience even more special. size of an empty toilet paper roll, to those who need them, but she needs help to deliver more. Sister Larraine Lauter, of the Ursuline Sisters of Mount Saint Joseph, is the executive director and only full-time employee of Water with Blessings, a nonprofit organization that helps put water filters in the hands of mothers around the world. "That's where the Water with Blessings model is different. The organization targets 'mothers and others,' those who play the role of mom. No matter where the organization sends filters, mother culture is always the same," Sister Lauter said. "Mothers share, and they don't say no to other people's kids." "I always say God has put smart women everywhere," she said. "This is not gringo to the rescue. This is not that model. I am troubled by that model. And even if these women are barely literate they can still be amazing trainers." Actor Mark Wahlberg at the recent premiere of the film Entourage. Movie actor Mark Wahlberg said he never would have been able to get his life back on track as a troubled teen if he hadn't had a strong relationship with his parish priest, according to an interview in Square Mile magazine. Wahlberg said he was saved from a life of drugs and violence when Father James Flavin intervened. The priest took him under his wing and taught him the importance of faith. Wahlberg, star of The Departed and many other films, is also an executive producer of the former television series and current movie release Entourage. “I never would have been able to change my life and have the success and love that I have in my world today without my faith,” he said. Pope Francis' encyclical on climate change is set to release by the end of June. From the United States to the Philippines, policy briefings, prayer vigils, and pilgrimages will take place to promote action regarding climate change. As Pope Francis prepares to release his encyclical on climate change soon, Catholics are readying themselves to advocate for the environment and maximize the effect of the document. Patrick Carolan, executive director of Franciscan Action Network, a Washington-based advocacy group formed by Franciscan religious orders, said, “This is such a powerful moment. We're asking ourselves, 'What would be the best way for us to support the faith community in getting this out and using it as a call to action?'" Pope Francis will issue the encyclical by the end of June, with an eye toward the end-of-year United Nations climate change conference in Paris. He will be the first pope to address global warming in such a high-level teaching document. Nancy Tuchman, director of the Institute of Environmental Sustainability at Loyola University Chicago, said, "I think the real hope is that he says it like it is and tells us there has to be a call to action and it has to be immediate." In fact, Catholics worldwide are working to mobilize for positive change for the environment. Catholic Earthcare Australia, the ecology agency of the Australian Catholic bishops’ conference, will plan an event on the encyclical at the Australian Parliament and will publish a book on the encyclical for parish use. In the Philippines, the Archdiocese of Manila’s ecology ministry is asking bishops to encourage parishes to ring their church bells when the document in released. Catholics around the world are excited to see the impact this encyclical has on public opinion and international policy regarding the environment. "The social justice aspect, and the way climate change is going to affect the poor and underprivileged and less privileged—that's not the first thing people think about when they think about climate change," said Lou Leonard, a World Wildlife Fund vice president who specializes in climate change issues. "For those who see this primarily as an issue of polar bears or other impact on species—which is all really important—this is an opportunity to say this is as much a human issue as anything else." asking for U.S. support for religious minorities uprooted by ISIS. Sister Diana Momeka, a Dominican Sister of St. Catherine of Siena in Mosul, Iraq, spoke at a congressional committee hearing on Wednesday. She was one of four women who addressed the importance of protecting religious minorities in the region as well as religious sites. Momeka recounted her personal story of being displaced after a bomb exploded at her convent in Mosul in 2009. The sisters were unharmed, but forced to move to Qaraqosh in Iraq’s Ninevah Plain. Last year, ISIS invaded the region telling them that they had three options: convert to Islam, pay a tribute to ISIS, or leave with nothing but the clothes on their backs. The sisters left and joined more than 120,000 people displaced in the Kurdistan region of Iraq. She shared how hopeless and fearful the displaced feel and urged that they be helped to return to their homes. She said that while they are struggling, the refugees have not lost faith. “We were displaced, yet the hand of God is still with us. In the midst of darkness we see God holding us," she said. a mobile app that brings church communities online. The Archdiocese of San Francisco is partnering with a new app, Evergive, which will allow Catholics in the area to donate money, share prayers, and more from their computers or smartphones. Father Anthony Giampietro, the interim director of development for the Archdiocese of San Francisco, said, "It helps our parishes, especially those with limited resources, get access to a level of technology that they never could have afforded." While in the past churches used online platforms such as Paypal and Gmail to digitize donations and communications, Evergive puts it all in one place. With more than 443,000 members, the Archdiocese of San Francisco is Evergive’s largest client to date, and Father Giampietro finds the ability to quickly organize donation campaigns on the application helpful. "The ease with which we could set up a campaign for Nepal or a youth group was astounding,” he said. The application also has a social aspect, where people can talk about issues or ask for prayers. James Ioannidis, CEO of Palo Alto-based Evergive, said, "Just because people are only physically going to church once a week doesn't mean that they only have to be part of that community once a week." is to work toward the union of God and neighbor without distinction. Death penalty opponent and activist Sister of St. Joseph Helen Prejean made headlines and was a trending topic on Twitter Monday for doing what she does best: social justice ministry. Sister Prejean was called to testify for the defense in the sentencing of the convicted Boston Marathon bomber. She said she had met with Dzhokhar Tsarnaev five times and that "he expressed sympathy for his victims during their talks," according to Boston.com. The jury is deliberating a sentence of death or life in prison for Tsarnaev. Prejean's story has become the subject of movies (including the Academy Award-winning Dead Man Walking, starring Susan Sarandon and Sean Penn), books, and even an opera. She has inspired national debate on the death penalty and helped drive the Catholic Church’s opposition to state executions. Prejean divides her time between educating citizens about the death penalty and counseling death row prisoners, which has included accompanying six men to their deaths. She also travels around the world giving talks about her ministry. Read more about her ministry and challenge to college students here. Diary of a Wimpy Kid became Commentarii de Inepto Puero, thanks to Father Gallagher's Latin translation. Monsignor Daniel B. Gallagher, an American who works at the Vatican’s Office of Latin Letters, recently helped translate the best-selling children’s book Diary of a Wimpy Kid into Latin, which remains the official language of the Roman Catholic Church. This new edition of the book was published by Milan-based Il Castoro, which teamed up with Gallagher to help with the translation. Although he is a skilled translator, Gallagher did admit that there were some difficulties in translating some modern concepts such as ‘wow’ or ‘heavy metal’ (which became “musica metallica gravis”). A page from Father Francis Gleeson's diary during World War I. The diary of Father Francis A. Gleeson, an Irish priest who became a World War I chaplain, is now available to read online. Father Gleeson traveled with the Second Battalio Royal Munster Fusiliers and kept a detailed diary while he was ministering to the soldiers. The diary came into the possession of the Dublin Diocesan Archives, which put it online for the public to read. Noelle Dowling and Peter Sobolewski of the Dublin Diocesan Archives worked for about nine months transcribing Gleeson's items, including his diary, letters he wrote to families of men missing or killed in action, and letters he received in return. The diary includes accounts of several incredible days on the front line, with Gleeson describing everything from coming under fire and thinking death was imminent to the excitement of having bacon to eat. Dowling said it is the soldiers’ faith during this difficult time that he finds most interesting in Gleeson’s accounts of daily life in the trenches. “They all would have had rosary beads, or holy pictures. There were stories of a bullet hitting a holy medal,” he said. Father Joaquim Carreira of Portugal risked his life to save dozens of Jews during the Holocaust. Father Joaquim Carreira, a Catholic priest from Portugal, has been honored by Israel for hiding Jews during the Holocaust while he was living in Rome as a member of the Pontifical College. The actions of Carreira, who died in 1981, remained largely unknown until Portuguese journalist Antonio Marujo began researching his story. This investigation led to the priest’s inclusion last year in Yad Vashem’s list of the Righteous Among the Nations, which is Israel’s honorary title for non-Jews who risked their lives to save Jews during the Holocaust, making him the third Portuguese citizen on the list. In April, Father Carreira’s nephew accepted a medal from Israel’s Yad Vashem Holocaust Museum in recognition of his late uncle’s actions at a ceremony held at Lisbon’s main synagogue. Sister Marge Clark has #TaxPayerPride for the beauty of the Capitol grounds in Washington, D.C. The nuns behind NETWORK, a national Catholic social justice lobby, are trying to take the anger and stress out of Tax Day. The nuns promoted the hashtag “TaxPayerPride” to remind people of the good services that taxes provide for society. They have asked people to post a photo with goods or services for which their tax dollars pay on social media platforms such as Facebook, Twitter, and Instagram with #TaxPayerPride. She said, “Caring for one another is a faith issue. We are all children of God, and government is meant to serve the common good. It’s that simple." The U.S. bishops are encouraging Congress to support the draft of a nuclear agreement with Iran. The head of the U.S. bishops’ international peace committee supports the new guidelines for Iran’s nuclear program and is urging Congress not to “undermine” the deal. The plan is the result of negotiations between the Islamic Republic of Iran, the European Union, and the P5+1 countries (United States, United Kingdom, France, Germany, Russia, and China), who are set to reach a final agreement on June 30. The plan reduces the number of Iran’s centrifuges and limits the level of uranium that can be enriched and the amount of low-enriched uranium that may be stockpiled. It also states that Iran would not be allowed to construct new enrichment facilities for 15 years and that the underground nuclear facility at Fordow must be turned into a research facility. The sanctions related to the nuclear aspect of Iran’s policies will be lifted while those placed upon the country due to human rights violations, terrorism, and ballistic missiles will remain in place. people who need help," Comboni Missionary Sister Gabriella Bottani said. Comboni Missionary Sister Gabriella Bottani was recently appointed coordinator of Talitha Kum, a project of the Unión Internacional de Superioras Generales (International Union of Superior Generals) and the Rome-based international network of religious sisters working to end human trafficking. In a Global Sisters Report interview, Bottani shared the staggering statistics of moderm-day human trafficking: "Between 800,000 to 2 million people are trafficked each year, 80 percent of whom are women and girls. Human trafficking facilitates sexual exploitation, forced labor, domestic servitude; it leads to organ removal and forced marriage." Talitha Kum's network is "now present in 81 countries and are more than 1,000 sisters strong. At first [in the early 2000s], the idea was to train sisters and have them become leaders in this area—and to go from there to create a movement. So the first step was to organize training programs in different countries. And the first goal was to inform and train sisters as to what human trafficking is. The second goal was to organize a network. In 2009, there was an international meeting that called all of the programs together. And it was decided to form this network, which was called Talitha Kum," Bottani said. The continued goal of Talitha Kum is to "strengthen our identity and to help the local networks improve their capacity to confront human trafficking." "We are in a very positive place with the engagement of Pope Francis and his commitment against human trafficking. I think he is helping the church to confront and to see this problem," Bottani said. Michael Keelan (left) and Father David Simonetti are set to open a unique high school in Chicago. A priest in Chicago is establishing a college prep high school that some are calling unprecedented. Father David J. Simonetti has financed the Pope Benedict XVI Academy of Excellence, which he plans to open in suburban Chicago in the fall, with his own money. While it is not affiliated with the Archdiocese of Chicago, it needs archdiocesan approval to rent six classrooms at St. Paul Catholic Church in Chicago Heights, Ill. Tuition and private donations are going to fund the school after its opening. So far, 10 students are enrolled and 35 are in the application process. The school will start with only a freshman class in the first year and continue to add new classes each year thereafter. Michael Keelan, who has been in education for 12 years, will be the school president. The students will study traditional subjects such as language arts and mathematics, with a modern twist. Some of the coursework will incorporate Illinois Virtual School, a supplementary online teaching tool, and the classrooms will be wired with smart boards, according to Keelan. Chicago Heights already has a Catholic high school, but the new academy’s tuition of about $5,900 would be about half of what other Catholic schools charge, and class sizes would be smaller. Graziano Marcheschi, Saint Xavier University's vice president of university ministry, said there are other non-archdiocesan Catholic high schools in the Chicago area, but they are usually funded by established religious orders. He noted that the smaller, more affordable option that this new school would provide would likely appeal to many people. "Easter at Ephesus" is the followup to chart-topping albums "Advent at Ephesus," "Angels and Saints at Ephesus," and "Lent at Ephesus" by the Benedictines of Mary, Queen of Apostles. The Benedictines of Mary, Queen of Apostles, are a young, contemplative order who pray, work, and sing at their monastery just north of Kansas City, Mo. Founded in 1995, these singing Benedictines have released their fourth album, "Easter at Ephesus," which reached No. 1 on Billboard's classical traditional chart and Amazon and iTunes' classical charts. According to Zenit, the new album "features an array of chants and hymns that are sung with a purity of sound that perfectly evokes and celebrates the Easter season." 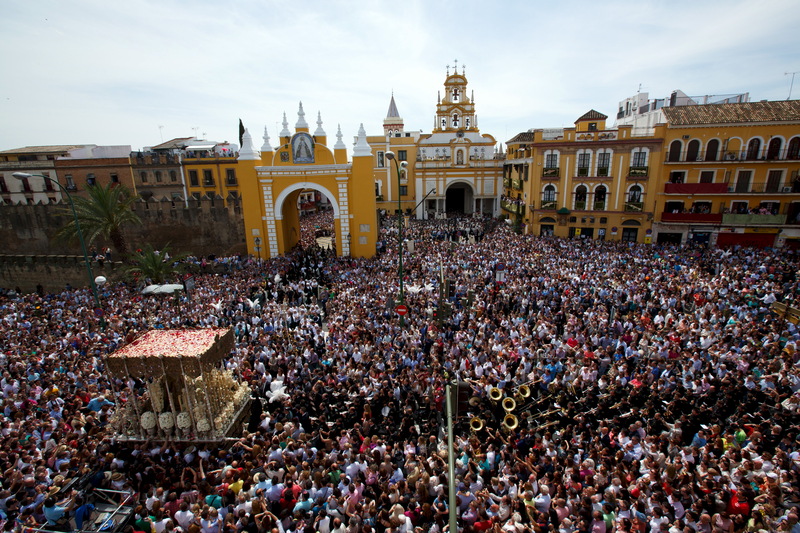 Crowds gather to watch processions during Semana Santa in Seville, Spain. In the days leading up to Easter, Christians around the world take part in various cultural and religious traditions to remember the life, death, and resurrection of Jesus. PBS has compiled a series of photographs that show different festivities. In Jerusalem, Christian clergy participate in washing of feet ceremonies, while in Spain, Semana Santa (Holy Week) is marked by processions. In the Philippines, penitents dress up as moriones, wearing soldier outfits from biblical times. While these many traditions are different, they all aim to honor Jesus and remind onlookers of the importance of Holy Week. See the photos and more traditions here. Pope Francis waves to the crowd in St. Peter's Square on Easter Sunday. Pope Francis celebrated Easter mass with members of the faithful who stood in the rain to see the pontiff. In his Easter message, he urged peace in countries around the world and specifically mentioned Syria and Iraq, along with the Holy Land, Ukraine, Libya, Yemen, Nigeria, Sudan, and the Democratic Republic of Congo. The pope gave the traditional Urbi et Orbi from the central balcony of St. Peter’s Square. These remarks come after those that he gave on Good Friday, in which he criticized the international community for its “complicit silence” regarding the persecution of Christians. green algae spirulina to care for those suffering from acute malnutrition. The children of Central African Republic have long suffered from malnutrition due to the ravages of the civil war that has divided the country since 2013. But at St. Joseph Health Centre in Bangui, under the direction of Sister Margherita Floris, there is hope growing in the form of algae spirulina. According to PBS Newshour, "The nuns of the centre, who serve women and children with pre- and post-natal care, do their best to alleviate the suffering of children with acute malnutrition. They have literally taken matters into their own hands." Using a French pharmacist's formula, the nuns produce vitamin-rich green algae spirulina in their own backyard. The spirulina contains all of the essential amino acids plus minerals such as iron, and it is a good source of protein. Catholics attend Catholic Advocacy Day in Austin, Tex. Catholics from around Texas traveled to the state’s capital, Austin, for “Catholic Faith in Action Advocacy Day.” The event was organized by the Texas Catholic Conference, which is known as the public-policy voice of Catholic bishops in Texas. Fox 26 reports that the participants, known as Archangels, gathered with other Catholics from dioceses across the state for a rally on the steps of the state capitol before meeting with legislators. The faithful met with lawmakers to promote legislation that would support the most vulnerable members of society. Watch the full news report here. Pictured with her parents, Sister Mary Joseph, born Barbara Evans, is now a Handmaid of the Heart of Jesus. Mother of six from Mendota Heights, Minn., Joan Evans recently shared with the New York Times her struggle with and acceptance of her daughter entering religious life. Evans said that she and their family miss their daughter and sibling but feel joy "that this is the vocation God designed for her and that it fulfills the deepest longings of her heart." Evans shared how she and her daughter, born Barbara Evans and now Sister Mary Joseph, said goodbye upon becoming a Handmaid of the Heart of Jesus: "I told her how much I would miss her and that giving her to the Lord had been one of the most difficult things I had ever had to do. Then I felt a surge of strength, looked her in the eye and added that I wouldn’t trade it for anything because I know she is exactly where the Lord wants her to be. In that moment, I experienced such grace. My daughter already offered her yes to this vocation. I’m doing my best to offer mine." Father Andrew Hofer, O.P. offers some great conversation starters in the article "How to talk to your family about your vocation". "Why I encourage my kids to consider religious life" is another article from a parent's perspective. Catholic Athletes for Christ helps athletes keep their faith strong while competing. Ray McKenna, a Washington-based attorney, has been busy recently at baseball spring training camps in Arizona and Florida. As a former minor-league baseball chaplain, McKenna knows the strain that being an athlete can place on religious commitments, so he founded Catholic Athletes for Christ 10 years ago. “The service is to provide the sacraments to the players so the players are able to practice their faith,” McKenna says. When he worked as a chaplain, he could give spiritual advice, but could not provide players with the sacraments. "The result of that logically was that players were leaving the Catholic faith and becoming so-called non-denominational, born-again Christians and not understanding and receiving the fullness of our Catholic faith," he says. The organization now has a network of priests who hear confession and celebrate Mass at stadiums, clubhouses, and practice fields. It also coordinates events with the Vatican’s Church and Sports office within the Pontifical Council for the Laity and the Knights of Columbus. While the organization had only focused on professional athletes in the past, it now has a program for middle-school and high-school athletes as well, helping them to work with their sports schedules to make time for faith. Tyler Flowers, catcher for the Chicago White Sox, is very grateful for the services that Catholic Athletes for Christ provides, saying, "They do a great job helping us. We can have Mass at the stadium at the majority of places we go." Missionaries of Jesus sister to speak to U.N. Sister Norma Pimentel, M.J., hopes the opportunity to speak to the U.N.
will bring more attention to immigrants on the U.S./Mexico border. Sister Norma Pimentel, M.J., ministers in the Rio Grande Valley of Texas to those on "the frontlines of the crisis on the border," according to ABC-KRGV. Pimentel, Sacred Heart Church in McAllen, and Catholic Charities have helped nearly 18,000 immigrants. She has been invited by the United Nations to address the organization and share her experience. "Oh wow, what an honor. I'm humbled to know that they asked me to do this," Pimentel says. Read the full article and watch the brief interview here. Catholic sisters marched with clergy and non-violent protesters in Selma, Ala. in 1965. A recent Global Sisters Report article, “The Selma effect: Catholic nuns and social justice 50 years on,” documents the vital role Catholic Sisters played during the civil rights march from Selma to Montgomery, Ala. in 1965. Pictures of Catholic sisters who marched were splashed on the front pages of newspapers all over the country. Those images of solidarity for the marginalized were a catalyst for the future of social justice ministries in religious communities. Read about the full legacy of the sisters’ stories of working toward "gender equality and women’s empowerment, education, health, poverty eradication, environmental sustainability, and global partnerships," especially during this National Catholic Sisters Week. Pope Francis greets a group of women at the Vatican. International Women’s Day was celebrated around the world on March 8. Pope Francis sent a special message to women around the world and thanked them for their contribution to the church and its mission. According to Vatican Radio, Pope Francis commended “all the women throughout the world who are seeking, every day, to build a more human and welcoming society,” following the Angelus on Sunday. “A world where women are marginalized is a sterile world, because women don’t just bear life but transmit to us the ability to see otherwise, they see things differently. They transmit to us the ability to understand the world with different eyes, to understand things with hearts that are more creative, more patient, more tender,” Francis said. Pope Francis then offered a special blessing and prayer over all the women in St. Peter’s Square and for women around the world. A volunteer from the Italian organization 'City Angels' speaks with a homeless person at the Vatican. Willy Herteller, an 80-year-old Flemish man who used to live in the streets near St. Peter’s Basilica in Rome, died in December last year. He has been buried in the Teutonic Cemetery, which dates back to medieval times, alongside clergy and aristocrats. While many reportedly tried to help Herteller find permanent housing, he ended up back on the streets and died on Dec. 12 due to cold. An anonymous German-speaking family paid for his funeral arrangements. As Pope Francis’ papacy continues to focus on helping the marginalized, the Vatican has been championing creative ideas to help those in need, such as distributing sleeping bags and umbrellas and building public showers near St. Peter’s Square. Religious tweet pictures with their ashes using the hashtag '#ashtag'. This last Ash Wednesday, a new trend emerged on the social media platform Twitter. Many religious tweeted pictures of themselves with ashes using the hashtag ‘#ashtag.’ The trend started last year, but gained even more traction this year. While some feel this trend is a great way for the church to be present on social media, others are not so fond of this display of faith. Greg Hills, an associate professor of theology at Bellarmine University, is not completely on board, but said, "I don't at all want to detract from something that may, for some, make for an even more meaningful Lent." Perhaps the #ashtag is here to stay. Pope Francis is welcomed by fans during his weekly general audience. On September 24, 2015, Pope Francis will become the first pope to address both chambers of Congress. House speaker John Boehner invited Pope Francis to address Congress during his visit to Washington D.C., New York, and Philadelphia later this year. “In a time of global upheaval, the Holy Father’s message of compassion and human dignity has moved people of all faiths and backgrounds. His teachings, prayers, and very example bring us back to the blessings of simple things and our obligations to one another. We look forward to warmly welcoming His Holiness to our Capitol and hearing his address on behalf of the American people,” Boehner said. While Pope Francis could touch on a wide range of topics during his address, many hope that he will continue to champion things such as immigration and climate change and encourage Congress to take action on these important issues. First priest, Franciscan, featured on Oprah's "Super Soul Sunday"
between us," said Father Richard Rohr, O.F.M., about his interview with Oprah Winfrey. NCR reports that Franciscan priest, Father Richard Rohr, O.F.M., of the New Mexico Province and founder of the Center for Action and Contemplation (CAC) in Albuquerque, New Mexico will be on Oprah Winfrey's "Super Soul Sunday" on Sunday Feb. 8 at 11 a.m. ET on the OWN network or online here. The focus of the interview will be one of Rohr's books, which he said Oprah "had highlighted page after page, arrow after arrow. She wasn't threatened by Catholic theology." But the book was so marked up, he said, that "she didn't get to ask one-tenth of what she wanted to say." He added, "she says she's going to have me back." Rohr's Franciscan ministry has strived for "45 years to preach the Gospel in a way that makes sense to a spiritual seeker, a person who's more secularly oriented, and to someone who's more theologically oriented," he said. On the topic of Pope Francis, which Rohr said he is often asked about, he said, "But the brilliance of Pope Francis—and I pinch myself every day that I've lived to see a pope like this—you see that he does bring Jesuit discernment, a kind of clarity of thought. If people want to write him off as bleeding-heart liberal or lightweight intellectual, you see he's really rather strategic. People in management see this. He's strategizing. ... He's strategizing the reform of the church. The discernment of spirits, as the charism is called, is the best of the Jesuit tradition. He's put together the two biggest orders of the church in just one man." Discover more about the Franciscans and the Jesuits today. Father Ray Kelly, famous on YouTube, will release his album in March. Father Ray Kelly became an Internet sensation after his version of Leonard Cohen’s "Hallelujah" went viral on YouTube. Now, he has released albums in both Ireland and Germany, and his U.S. album is set to be released on March 10. Kelly understands how lucky he is, saying, "Ninety percent of people don’t get a break and now, at this stage of my life, it is happening for me. Dreams do come true." The priest’s album is entitled “Where I Belong" and will feature his famous version of “Hallelujah” along with some other modern songs, three Irish folk songs, two traditional hymns, and two original tracks. Kelly reassured fans that this newfound success will not draw him away from his most important job. "I'm fairly grounded at this stage in life. I'm happy with the job that I have, the music is going to be a fantastic sideline, and I'm going to enjoy it as much as possible. As long as I enjoy it I would keep doing it." Father Josh Johnson speaks about his vocational journey. Father Joshua Johnson, 27, is a priest at Christ the King Catholic Church at Louisiana State University in Baton Rouge. He is the youngest priest in the diocese, and uses his gifts of rapping and storytelling to connect with young Catholics. He first encountered Christ through Eucharistic adoration during a retreat, but even after he understood his calling, he was not ready to accept it. Still, he went on to earn his master's degree in theology from Notre Dame Seminary in New Orleans. President Obama mentioned Pope Francis in his recent State of the Union address. Pope Francis was mentioned by President Obama in his recent State of the Union address, marking the third time in U.S. history a pope has been referred to during this speech. Obama praised Pope Francis’ diplomatic abilities. “As His Holiness, Pope Francis, has said, diplomacy is the work of 'small steps.' These small steps have added up to new hope for the future in Cuba,” Obama said. Pope Francis has been credited with helping the United States and Cuba re-open diplomatic relations with each other. He sent personal letters to leaders of both countries, and the Vatican was host to many talks between the United States and Cuba. While many popes have influenced diplomatic relations throughout history, only two other presidents have mentioned a pope in their State of the Union addresses. The first was President Lyndon B. Johnson, who mentioned Pope Paul VI. The second, President Bill Clinton, who spoke about Pope John Paul II. Sister Donna Markham, the new president of Catholic Charities. Sister Donna Markham, O.P., an Adrian Dominican with a background in clinical psychology, has been named the next president of Catholic Charities, USA. This makes the first time in its 105-year history that a sister has been named the head of the organization. Catholic Charities serves more than 9 million people annually, making it extremely important to the social justice and service work of the Catholic Church in the United States. “I feel blessed to walk among the many dedicated Catholic Charities workers across the country who daily make the gospel come alive through their care for their sisters and brothers in need," Markham said in a statement released by Catholic Charities. Read more about the Adrian Dominicans. Benedictine nuns at the Abbey of St. Walburga raise cattle, water buffalo, llamas, chickens, and bees. A few miles south of the Colorado-Wyoming boarder, Benedictine nuns at the Abbey of St. Walburga raise cattle, water buffalo, llamas, chickens, and bees. Sister Maria Walburga Schortemeyer runs the abbey’s ranch, while other nuns volunteer their time to feed and milk the various animals. The nuns sell the natural beef—mostly to those looking for organic, cruelty-free food. “We have kind of a corner on the market," Schortemeyer says. "People just kind of believe in it." They have sold their all-natural beef for about seven years, and sell out of their product regularly. "We always have a waiting list for the beef," Schortemeyer says. While this may seem like an unusual way of life for nuns, the bond between agriculture and religious orders dates back centuries, when monasteries were self-sustaining. While they have received their fair share of criticism, the nuns feel that the farm connects them to the outside world. People march with signs in San Salvador on the anniversary of Oscar Romero's assassination. Oscar Romero, a former archbishop who was assassinated in El Salvador in 1980 while saying mass, is one step closer to sainthood. He has been named a martyr by a panel of theologins at the Congregation for the Causes of Saints. The ruling was unanimous. Romero was shot after delivering a homily calling for soldiers to lay down their guns and end government repression during the country’s bloody civil war. After being named a Servant of God by Pope John Paul II in 1997, Romero’s case lingered because of concerns about his ties to controversial liberation theology. Pope Francis reopened the case, and it is reported that he is supportive of Romero’s sainthood. While sainthood usually requires two miracles, one for beatification and one for canonization, only one is required for martyrs, as they can be beatified without a miracle. Pope Francis delivers his noon address on New Year's Day. Pope Francis emphasized the importance of working together: "All of us are called (by God) to be free, all are called to be sons and daughters, and each, according to his or her own responsibilities, is called to combat modern forms of enslavement. From every people, culture, and religion, let us join our forces." This papal goal for 2015 comes as no surprise to many. Pope Francis has recently asked both consumers and heads of state to be aware of how goods are produced and the negative effect of forced labor, and he has also championed the rights of workers. Pope Francis holds up a prayer book while encouraging listeners to find joy during Advent. This past Sunday was the “Sunday of Joy” during which many priests around the world wear rose-colored vestments to represent the joy of anticipation. Pope Francis sought to remind the world that in the rush towards Christmas, many people feel overwhelmed. “Think of all the good things life has given you . . . don't forget joy,” he said. The construction site of AMATAK House of Cambodia's 19th school. Father Fumio Goto, 85, has helped build 18 schools in Cambodia, and is working on No. 19. Each new school serves about 200 children who would not be able to get an education otherwise. A member of the Society of the Divine Word, Father Goto heads AMATAK House in Cambodia, a nonprofit organization based at Kichijoji Catholic Church in Tokyo. The new school that is underway will serve five villages that are often overlooked by other aid efforts. Father Goto explained that many nonprofits tend to give aid to areas with high levels of infrastructure, often leaving underdeveloped areas neglected. Football coach Sister Lisa Maurer encourages players from the sideline. Benedictine nun Sister Lisa Maurer lives at St. Scholastica Monastery on the campus of the College of St. Scholastica in Duluth, Minn. In addition to working at a health center and ministering to the community, she also coaches the college football team. While this is the first football team Sister Maurer has coached, she had experience coaching girls’ volleyball, basketball, and softball before becoming a nun. She loves sports, and even though she never coached football, she always had a love for the game. “I was around football only because my dad was a football coach, obviously my brothers played and, you know, football is a staple in America. So I’m a lover of football but never played or coached it until this year,” she says. This love drew her out to the football field whenever she had free time, where she would watch the players practice. The head coach, Kurt Ramler, eventually asked her if she would be interested in a coaching position. While she wanted to make sure it did not interfere with her vocational duties, she felt this position would allow her to establish relationships with student-athletes, so she accepted. Maurer is the designated coach of the team’s kickers and punters. She aims to teach more than football to her players. “They have an awesome opportunity to get a great Catholic college education … plus they’re getting to play football, and along with that comes responsibilities of character and being … a good role model,” she says. She, too, is a role model for both women religious and those discerning vocations, and hopes that her non-traditional role will inspire young people to think about religious vocations. “That is very near and dear to my heart because, you know, in our day and age, with all the different voices and all the different influences that young people have, it saddens me to think that the voice of God and the call of God could be getting drowned out,” she says. Pope Francis extends his hands to a child with autism. Last Saturday, during the international conference on autism hosted by the Vatican, Pope Francis spoke about the importance of hope for children and families affected by the condition. The pope encouraged people around the world, especially governments and institutions, to break “‘the isolation, and in many cases also the stigma" associated with autism, which is characterized by varying levels of social impairment and communication difficulties. The pope’s words touched everyone in the audience, especially families of those affected by autism. "It was an explosion of emotions," said Maria Cristina Fiordi, a mother of a child with autism. "For us, we are parents of a child affected with autism, this meeting was very important. It was as an outstretched hand through a problem that is very often not considered in the right way." Sister Rosemary Connelly runs Misericordia with "a kind smile and an iron will." Sister Rosemary Connelly, R.S.M., has been named one of the "2014 Chicogoans of the Year," by Chicago magazine. Sister Connelly, executive director of Misericordia, a group home for the developmentally disabled, has been leading this nonprofit for 45 years. Connelly points out in the magazine that until 1975 disabled people received only custodial care through the state, with no educational or therapeutic programs. Misericordia offers speech, occupational, and physical therapies, as well as yoga and dance classes, an aquatic and fitness center, and residents work at a bakery and restaurant. "Our philosophy is based on the belief that our children and adults have a right to a good life, and they deserve to be engaged in that life,” Connelly said. “Here, they know they’re loved and challenged and respected.”"
Pope Francis eats dinner with young people in Rio de Janeiro, Brazil. David Geisser, a young chef from the Vatican’s Swiss Guards, has created a cookbook of the favorite dishes of the popes, including Pope Francis. The book, “Buon Appetito,” also features mealtime prayers. It has been released in German, and the Italian version is set to come out next year. So, what are Pope Francis’ favorites? Empanadas; roast sirloin, known as colita de cuadril; and dulce de leche. Pope John Paul II enjoyed pierogis, of course, and Pope Benedict XVI loved Bavarian delicacies, all also in the cookbook. Pope Benedict XVI during his trip to Cuba in 2012. For the first time in 55 years, a new Catholic church is being built in Cuba, which marks a shift in the country’s policy on the Catholic Church. The church, which will be built in Sandino in the western province of Pinar del Rio, will be able to hold about 200 people, according to Christian Life. Catholics in Tampa, Fla., helped to raise funds for its construction. Since the 1959 revolution, the relationship between the Catholic Church and the Cuban government has been rocky, but improving steadily, especially since both Pope John Paul II and Pope Benedict XVI visited the country. Sister Cristina, who became a YouTube sensation after her performance on the TV show, ‘The Voice of Italy’, went on to win the entire competition—and a record deal with Universal Records. The song that made her famous, ‘No One’, was originally preformed by Alicia Keys and will be featured on Sister Cristina’s debut album. Universal Records recently released a short teaser for the album on YouTube, which features some video footage of Sister Cristina in the recording studio. Holiness and Hollywood seem to go hand in hand these days. The latest religious film reportedly coming to theaters soon is Martin Scorsese’s upcoming project, Silence, starring Andrew Garfield and Liam Neeson, which will begin shooting in Taiwan later this year. The film is based on a 1980 novel by Shusaku Endo, set in 17th-century Japan. This is not the first time the Jesuits have been featured in film. Movies such as The Mission (1986) and Black Robe (1991) show Jesuits in action. Why is the order popular among Hollywood filmmakers? “Jesuit missionaries were on the forefront of globalization before the term became trendy. Their lives and ministries dramatized the meeting of civilizations. … That’s high drama,” Rev. Thomas J. Reese explained in The Huffington Post report. Yazidi families, escaping violence, take cover under a highway overpass outside Erbil. Photo credit: H. Khalid for CRS. "The local church’s action is a witness of the 'New Evangelization' in which Pope Francis calls on Christians to proclaim peace in and for the world," says the pastor of St. Mark Catholic Church in Richmond, Kentucky. After seeing on Huffington Post, the Pope’s first ever photo tweet (retweet/RT) of the Catholic Relief Services image of two Iraqi children escaping violence from ISIS (Islamic State of Iraq and Syria), I took renewed interest in the facebook campaign in support of the Chritians being persecuted in Iraq represented by the Arabic character for the letter “N.” The “N” stands for Nazarene and was first used by militants to identify property owned by Christians violently forced to leave Mosul, Iraq. Perhaps you have seen the symbol replacing friends Facebook profile pictures throughout the summer? Let these images and symbols continue to be a reminder to #prayforpeace. Recently, I went on a family vacation to Alaska where breathtaking views greet you at every angle. Coming from Chicago, I was not used to air so clean or skies so clear. The water was blue, dozens of whales swam through the ocean, bald eagles flew through the sky, and massive glaciers could be seen peaking through the mountains. Everywhere I turned there was another beautiful part of nature--of God’s creation, but, as I learned, there are also many threats to this pristine land. Perhaps people taking this trip in the future would not see the same things I had the privilege to experience. Would I come to this place in 20 years with my children to find it all destroyed? Pope Francis is reported to be writing an encyclical on the environment. I look forward to his guidance and wisdom on this important issue. In a talk in July, he said, "This is our sin, exploiting the earth and not allowing her to her give us what she has within her." I will be the first to admit that the earth has not my number one priority. But after my Alaskan adventure, I realize how truly amazing the earth is. I am coming to understand that care for the poor and justice and peace go hand-in-hand with care for the environment. What good is a peaceful world without a healthy place to live? And how can we achieve peace when so many conflicts stem from people fighting for accesss to resources. God gave us this precious gift to protect, and we must take our role as stewards seriously. Time for Pope Francis to weigh in on the best pop albums? Four years later, we have a new pope and many new artists taking the stage. Perhaps a new list to enlighten the musical tastes of the faithful is needed. And who knows, maybe we will see Pope Francis on a musical fact-finding mission at Lollapalooza or Coachella next year! Francisan Saint Marianne Cope's remains return to Hawaii and will be held in the reliquary in the Cathedral of Our Lady of Peace, Honolulu. Saint Marianne Cope, a Franciscan sister, was working with the leprosy patients in the Hawaiian island of Molokai when she died in 1918. At the time, her remains were returned to Syrause, New York, to the motherhouse of the Franciscan Sisters of the Neuman Communities. Now the building which housed her remains is no longer structurally sound, according to an Associated Press report, and her community made the decision to return the saint's remains to Hawaii where she served most of her life. Her fellow sisters carried her remains out of the building in a box shaped like a canoe made of Hawaiian koa wood. When the remains arrived in Honolulu, “hundreds packed into the cathedral," according to the AP report, "where people lined up for a chance to kiss the box. The remains will be kept in Honolulu where they will be entombed in a special chapel. Learn more about the Sisters of St. Francis of the Neumann Communities. This 19th-Century gold dalmatic worn by deacons during special occasions such as Christmas and Easter is one of many items on display at "Crossings and Dwellings." Loyola University Museum of Art (Chicago) exhibition: “Crossings and Dwellings: Restored Jesuits, Women Religious, American Experience, 1814–2014,” which opened on July 19 and runs through Oct. 19- is using historical maps, books, objects, and textiles, to tell the story of European Jesuits and women religious who arrived in America's borderlands to serve indigenous and immigrant populations. According to Catholic New World, curator Jesuit Father Stephen Schloesser, a professor of French history: "Hopes the exhibit helps people realize that the Jesuits and the other religious who came to the United States were immigrants, some serving immigrant populations and others going out to evangelize among the Native Americans. “In a way, it make totals sense for a European historian to do this,” Schloesser said. “It gets at the idea that this is the American story, a story of immigration.”"
"The exhibit, mounted in honor of the 200th anniversary of the second Jesuit restoration, starts by telling the story of the Jesuit presence in the American Midwest and their travels across North America. It also looks at the contributions of religious women to the development of Chicago and other parts of the United States, particularly the Religious of the Sacred Heart and the Sisters of Charity of the Blessed Virgin Mary." A 1930 photo of Sister Mary Justitia Coffey, BVM, the first president of Mundelein College, and her desk also on display at the LUMA exhibit. Franciscan Friar, Fr. Bob Hutmacher, O.S.F., of Chicago, hoping to go viral on youtube to help fund a PBS video project on creativity. Learn more about the project at www.chiesanuova.org. Learn more about the Franciscan Friars here. Pope Francis takes on mafia, again! In January, following the death of a 3-year-old boy after a Mafia ambush, Pope Francis began speaking out against organized crime. Then in June, the pope traveled to the place of the murder and “accused Mafia members of pursuing the ‘adoration of evil’” according to a report in Huffington Post, and even went so far as to excommunicate members of the mafia. Next, Pope Francis will visit a mafia stronghold near Naples, in the town of Caserta, and many are wondering what this fierce anti-mafia stance will do for his papacy and his papal legacy. The problem the Vatican and the church is facing is that Catholic rituals and practices are often “embedded in the secret rituals and practices of the Calabrian Mafia” and other rings of organized crime.